Westerly is a town on the southwestern shoreline of Washington County, Rhode Island, United States founded in 1669 by John Babcock. It is a beachfront community on the south shore of the state. The population was 22,787 at the 2010 census. On the western border of Westerly flows the Pawcatuck River, once renowned for its own species of Westerly salmon, three of which are on the town's crest. The river flows from some fifteen miles (24 km) inland, emptying into Little Narragansett Bay. It also serves as the boundary between Westerly and Pawcatuck, Connecticut. Along the coast of Westerly lie salt ponds which serve as shallow reeflike pools whose outer walls form the long, white beaches for which the town became renowned. From west to east, these ponds are called Maschaug Pond, Winnapaug Pond, and Quonochontaug Pond. The town also has the fresh water lake Chapman's Pond which is undergoing revitalization. A type of granite known as Westerly granite has long been quarried here. Westerly granite is ideal for statuary and has been used in numerous government buildings of several states along the eastern seaboard. The Westerly area was known for its granite and stone-cutting industry. Westerly's primary industries today are textiles and tourism, but the town was historically famous for its granite, quarried in at least two locations in Westerly, in Bradford, and in Potter Hill. 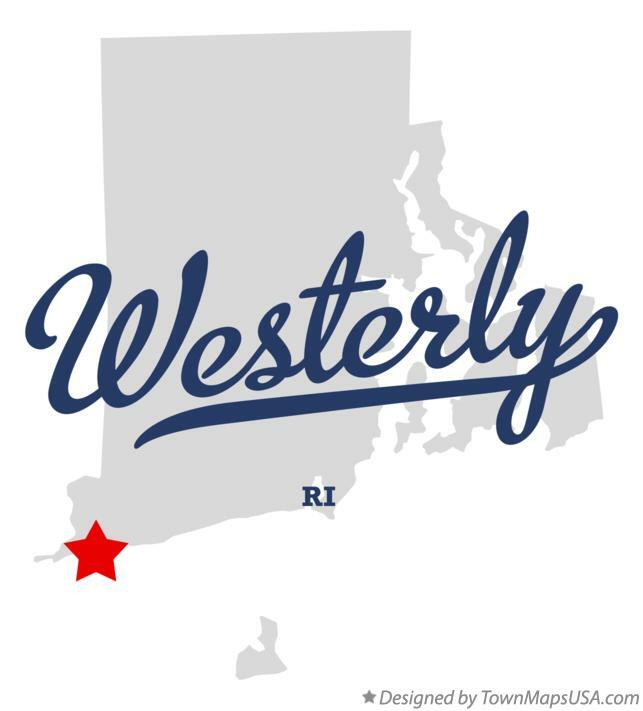 Westerly was probably named for the settlement's location respective to Rhode Island's geography, being the westernmost town in the state. But there is also a possibility that the town got its name from the English village of Westerleigh, in the county of Gloucestershire. The English village was the home of one of Westerly's founding fathers Elder John Crandall (ca. 1612-1676). Elder John settled in Westerly in 1661, and the early history of Westerly contains many references to him and his sons. The four trolley lines of the Groton and Stonington Street Railway, Norwich and Westerly Railway, Pawtucket Valley Street Railway, and the Ashaway and Westerly Railway converged in Westerly and shared track between the railroad station and Dixon House Square downtown. The lines were built in the 1890s and 1900s and ran until the 1920s. Updated: 23rd April, 2019 8:31 AM.